Noticing the whites of your eyes are yellow can be quite startling. Yellow eyes are caused by jaundice. It’s good to know that jaundice itself is not a disease. However, it is a sign of an underlying medical condition. ​Fortunately, treating the underlying condition usually helps clear up jaundice and the yellowing of eyes associated with it. What is Jaundice & How Does It Affect the Eyes? Jaundice occurs when there is a buildup of a compound in the body called bilirubin. Bilirubin forms from the normal breakdown of red blood cells in the body. Normally, bilirubin travels through the blood to the liver and binds to bile. Bilirubin is then transported through the bile ducts to the digestive tract and eliminated. If some point in the process breakdowns, it can cause bilirubin to build up in the body. This leads to deposits on the whites of the eyes and the skin. Bilirubin has a yellow pigment, which is why the skin and eyes may turn yellow. In most cases, jaundice starts gradually and may barely be noticeable at first. The severity of the yellowing also may depend on the level of bilirubin in the body. The condition affects both eyes. In addition to yellowing of the whites of the eyes, the skin also turns yellow. 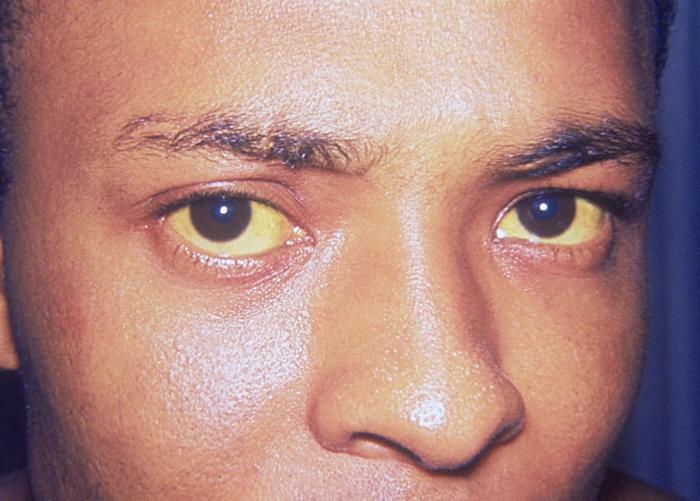 Hepatitis can lead to jaundice that affects the eyes. Hepatitis involves inflammation of the liver, often caused by a virus. The condition can be acute and only last a short time, or it can be chronic. The inflammation often damages the liver, which prevents the liver from processing bilirubin properly. Additional symptoms of hepatitis include abdominal pain, nausea, and fatigue. Chronic alcoholism can also damage the liver and lead to jaundice. The amount of alcohol and the years of drinking it takes to develop liver damage vary. When liver damage does develop though, it may cause jaundice. The gallbladder also plays a role in the normal processing of bilirubin. The gallbladder stores bile. If the bile ducts become obstructed or blocked, it can interfere with bilirubin binding with bile and being adequately eliminated from the body. The most common cause of gallbladder disease is gallstones. Other possible causes of bile duct blockage include gallbladder inflammation, cysts, and tumors. Symptoms of gallbladder disease include nausea, vomiting, and weight loss. There are also a few less common causes of jaundice in the eyes. For example, after a blood vessel in the eye breaks, some blood can spread to the white part of the eye, causing discoloration. Usually the discoloration is red. However, it can also have a slightly yellow hue to it as it heals. Similar to how a bruise changes color as it heals, the whites of the eye may also take on a slightly yellow tint. Hemoglobin in red blood cells produces biliverdin. Biliverdin break downs and produces bilirubin, causing yellowing. If the yellowing is due to a broken blood vessel, it only appears in one eye. A few different genetic conditions that lead to excess iron in the liver and affect its functioning may also cause jaundice. Certain uncommon disorders of the blood and pancreas can also lead to a build-up of bilirubin and jaundice in the eyes. There are a couple of misconceptions about jaundice in the eyes. One is that people who develop jaundice in their eyes may be concerned about it affecting their vision. It’s important to know that in reality, while jaundice itself does not affect vision, the underlying condition causing jaundice may lead to complications that could affect the eyes and eyesight. As such, anyone with jaundice should see his or her doctor, as well as eye doctor. Having a baseline eye exam can determine if the eyes or vision has been effected, if any treatment is needed, and at what intervals eye exams should be performed to help protect the eyes and vision. Another misconception is that eating lots of foods high in beta-carotene, such as squash, melons, and carrots, can cause yellowing of the eyes. Consuming large amounts of beta-carotene may give the skin a slightly yellow tint, but should not affect the eyes. Jaundice treatment involves targeting the underlying cause and not the yellowing of the eyes specifically. Treatment may vary depending on the cause. For example, hepatitis is usually treated with antiviral medication, while obstructions in the bile duct may be treated with surgery. Once the underlying cause of jaundice is treated and bilirubin levels return to normal, jaundice and yellowing of the eyes should clear. If you notice yellowing in your eyes, you need to contact your doctor to determine the cause. The quicker your doctor finds the cause, the sooner you can receive treatment, which may improve jaundice. If you have any questions about jaundice or yellowing of eyes, or if you would like to schedule an appointment with one of our eye doctors, please call our office at 508-746-8600.